Shri Mahesh.V.S., Mayur Solar Electrification ( P ) Ltd., Mangalore Receiving “Rashtra Nirman Ratna Award 2002” on National Seminar by Mr. Sanjay Paswan , State Minister of Resource Development, Govt. of India on 10th July 2003 New Delhi. 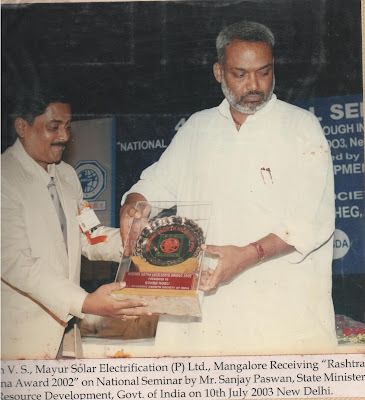 Mahesh.V.S in 1994 started a small enterprise at Mangalore, having understood the scarcity of energy fuels, started Mayur Solar Electrification ( P ) Ltd., & has taken strides by creating an awareness of Solar energy among the people of Karnataka & up to Kottayam in Kerala and he can be rightly called as the “Solar Magician”. Presently he is the Director of Sun Ray Solar Museum & Sun Ray Akshay Urja Shop ( An approved Govt. Outlet ). He is an active member of District Advisory Renewable Energy Committee, Dharwad. Solar City Committee, Solar Energy Society of India.New Delhi, Karnataka Chamber of Commerce and Consumer Forum,Hubli. He is visiting faculty to KMF, HESCOM, NWKRTC, District Agriculture Training centre. The scientific and technological advancement of Germany, U.S.A and other western countries, is only through the objective, materialistic study and research of Vedas including Shukla Yajurveda given to Yaganavalka by Sun God. Yaganavalka then in ancient India showed the world the Power of Sun. Now, Sri. Mahesh.V.S of Hubli through his “Sun Ray Solar Museum” does the same.